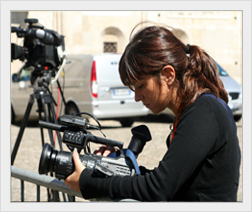 The Naxatra Institute of Media Studies (NIMS) is run by the Nabadigant Educational Trust. Under Dep't. Of Higher Education affiliated to Odisha's premier Gurukul: The Utkal University. The Utkal University.The Institute was born as a vision to provide better education in the field of Mass Communication and its realization came in the year 2009 after getting the permission from the Ministry of Higher Education, Govt of Odisha. The Institute fully equipped with an excellent library, audio-visual aids, computer, internet and a host of latest facilities. Journalists play a major role in the development of nation. They are the watch dogs of the society. The purpose of journalism is to inform, educate and enlighten the people. And at NIMS, the students will be trained in all these functions. Because the opportunities for journalists are endless but at the same time the job has become quite challenging too, as the new world is proving the adage that “the Pen (and the Camera) is mightier than the sword”. We at NIMS hope that our budding journalists will not only be competent practitioners by today’s standards, but also that they will help raise those standards. Copy Rights NAXATRA INSTITUTE OF MEDIA STUDIES. All rights reserved.